Understanding cloud computing advantages helps set the right expectations when using the cloud-based system. This could lessen the frustration, instead, mitigate setbacks on your business. Cloud computing became popular especially to Small and Medium Businesses since it offers the flexibility not only in computer resources offered, but also with the price. Getting the value for your money based on what you business consumes is the perfect feature for starting businesses. But that is not the only feature of cloud computing. 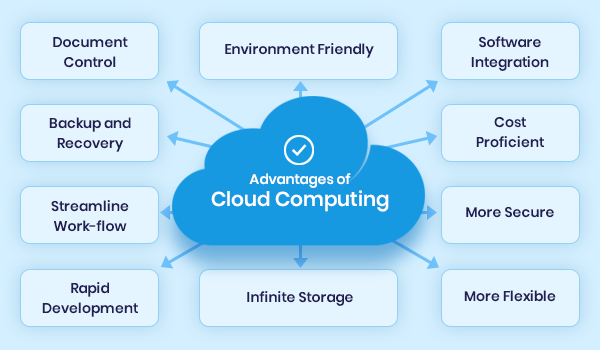 The list of cloud computing advantages presents the best to expect, and the worst that you should do something about. Cloud computing is not perfect, and just like any other service, it has certain solutions that go with its shortcomings. Know the features, and prepare the solutions. Affordable and practical even for small and medium businesses. The list of cloud computing advantages will always include cloud’s best feature — cost effectiveness. For businesses that are just starting with their online venture, cutting cost is a necessity, and it becomes interesting for businesses to acquire a service that can be cheap and flexible like cloud computing. Small and medium businesses aim to earn while keeping capital and operational expenses within a tight budget. Thus, they take interest in saving costs through cloud computing where there is no need to invest in an in-house server storage and other application requisites. Since there is no computer infrastructure that has to be built, businesses save the operational costs usually allotted for power, air-conditioning and administration. Also, the flexibility of resources and price depending on the usage of your website is the best deal a growing business can get out of cloud computing. The pay-per-use policy enables even small businesses to avail cloud computing services. Since cloud computing is managed service platform, it is consistent than the usual in-house IT infrastructure. Cloud computing providers guarantees this consistency and reliability with a 99.00% accessibility and 24/7 availability of all needed services. Reliability is one of the most important in the list of cloud computing advantages since an online business loses revenue when there are unexpected outages that take down a website. Addition to the cloud computing advantages is how manageable cloud computing is. Since its IT management and maintenance are enhanced and simplified, and all resources are managed by the service provider, you will be relieved from the hassle of installation and configuration. The software, applications and services are guaranteed timely updates, management and maintenance. Gives the strategic edge in the market. Part of the cloud computing advantages is the strategic edge that a business gains against its competitors when it has cloud computing services. Cloud computing can provide all the time for you to take care of your business than stress yourself with IT procurement and other tasks you need for in-house servers. You don’t need to waste time in buying the necessary IT infrastructure because all is provided by cloud. Also, you can easily deploy mission critical applications that can help your business boost its performance in the Ecommerce market. You can render more of your time in marketing your applications than managing your system. High Speed is one of the most sought after cloud computing advantages of any business website, since the slower your page loads, the higher the chance that you’ll lose that customer. If pages need more than 3 seconds to load, clients often leave the site or gets disappointed with your business altogether. Cloud computing provides high speed for its clients and deploys resources needed by the system in a timely manner. Accessibility is also the most popular cloud computing advantages since this allows any end user to access their data anywhere, anytime. You can use different devices, yet there will be no need to transfer your data from one to another. Storing information through cloud makes the data accessible, while promoting collaborative work and efficient transfer of data. Backup and restoration of data is one of the cloud computing advantages that all users and business would want. Since anything in the internet is vulnerable to attacks, it is advisable that precautions like backup and how data can be restored becomes a need for the business. Cloud computing can ensure that despite situations like a data breach, the business will be able to bounce-back since all data are intact in its backup through the cloud.